Peep Show | TURN OFF YOUR CELL PHONE! The best writing advice I ever got was that you should stay away from all-encompassing adjectives. Don’t call things “funny” or “interesting” – let the reader decide. Just tell them what it is. And I’m terrified to tell you about Peep Show. The problem is that Peep Show is, in fact, incredibly funny (and realistic, and wonderfully dark), and I love this show so hard that I feel like it’d be better for a millstone to be put around my neck and be thrown into the sea than for me to pitch Peep Show wrong and have someone miss out, so I’ll start by appealing to authority and say that Ricky Gervais has said it’s the only thing on UK TV this decade he got excited about, and that The Guardian blogs every episode like they do The Wire. 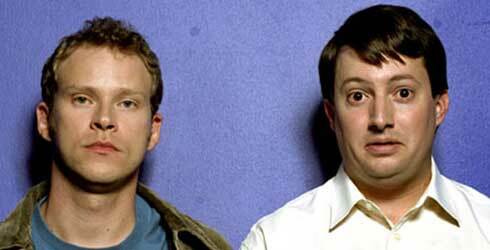 Peep Show is the story of Mark and Jeremy, college friends, now in their thirties, who live together in London. The show gets its name from its POV shooting style, and the fact that we’re privy to their thoughts via voiceover. So it’s your basic codependent odd couple scenario, but it’s neither claustrophobic nor stale. Mark and Jez are types to start, but the show is so well written that we quickly get to know them as very specific characters (and Jeremy, in particular, is a terrifically weird guy). You aren’t stuck in the apartment with them either – there’s also a full workplace comedy at Mark’s job and the characters have their own friends and families and are often out and about in the world. Another strength of Peep Show is that the female characters aren’t just girlfriends (i.e. thinly sketched objects of desire, whose only function is to pleasure or hurt out heroes). The women on the show are as well drawn (and strange and venial) as the men, and Sophie (who is the female lead and who appears throughout every series) has grown into the most complicated character on the show. Anyway, there’s a mysterious benefactor who has posted every episode of the first five seasons on youtube. Just search “Peep Show s0x e0x” and there it’ll be in three easy parts. Each series is just six thirty minute episodes, so if you fall in love like I did you will rip through these in no time. The pilot’s all well and good, but since all pilots are kind of weak I’d suggest watching the second episode of the first series and making you mind up from there – episode 3 is fine and episode 4 is a total classic. Watch those three and if you laugh at all, know that it keeps getting better, and that the fourth series (particularly the last two) is the best television I’ve ever seen. This entry was posted on December 29, 2009 at 12:55 am and is filed under Uncategorized. You can subscribe via RSS 2.0 feed to this post's comments. You can comment below, or link to this permanent URL from your own site.